Group psychotherapy helps you to learn how to understand and accept yourself more, develop insight into who you are and how others see you, improve ﻿your communication skills, and develop better more fulfilling relationships. An 8 week group psychotherapy programme to help you develop better relationship skills and increased self-understanding and acceptance. The programme includes 8 weekly 90 minute group sessions, a 30 minute individual assessment session, and a 50 minute individual exit interview at the completion of the group to discuss your experience and next steps. 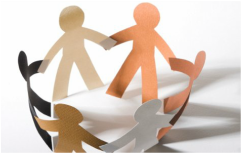 Group psychotherapy sessions will be co-facilitated by James Driver and Selina Clare. The short answer: Because it can be just as, if not more effective, than individual therapy and it’s cheaper. The longer answer: Research has shown group therapy to be more effective than individual therapy for the vast majority of people. 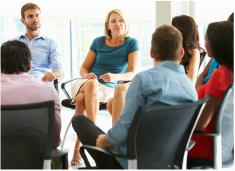 You will find that group therapy can help you with issues including depression, anxiety, substance use problems, relationship problems and personality disorders. If you experience challenges around the way you relate to others, such as social anxiety, you are likely to find group therapy even more helpful than individual therapy. Discovering and accepting previously unknown or unacceptable parts of myself. Being able to say honestly what was bothering me instead of holding it in. Other members honestly telling me what they think of me. Learning how to express my feelings. The group’s teaching me about the type of impression I make on others. Group therapy does this by creating a safe, non-judgemental space to be curious about yourself. A space where you can notice the thoughts and feelings you have in relation to other people and the way in which your ways of relating are helping or hindering the relationships in your life. Regardless of your reasons for seeking therapy, this relational style of therapy offers significant benefits for yourself and your relationships. Below are a few specific examples of how group therapy is directly beneficial for some of the challenges that many of us face. It goes without saying that our relationship problems are best addressed by looking at the ways in which we relate to others! Although relationship problems may only occur with specific people in your life, by better understanding your thoughts, feelings and reactions to a variety of people, you gain more insight into your typical patterns of relating. This insight helps you to find more effective ways to resolve challenges and conflicts that occur with others in any situation. A lot of anxiety stems from our interactions with others, whether it is fear over expressing ourselves, fear over sharing our emotions, or fear about conflict and confrontation. Group therapy will help you to develop the confidence to express yourself by sharing your thoughts and feelings honestly without fear holding you back. This helps you to feel calmer and enables you to form meaningful connections with others without sacrificing yourself or feeling fearful. Common features of depression include a tendency to cut ourselves off from others around us, and to have strong negative ideas about how others see us and feel about us. Depression can also cause us to see parts of ourselves as unacceptable or unlovable. Group therapy helps us to come to know and accept these previously unacceptable parts of ourselves, and to see ourselves more realistically through our interactions with others. At the same time, it helps us to reconnect with others and through doing so, rebuild ourselves. Many substance use and addiction issues are made worse by the ways in which we relate to the people around us. Often we use substances as a way to manage difficult feelings and reactions to the important people in our life. Group therapy will help you to develop the skills to manage your feelings and responses to others, and have more freedom and control over the way you relate to others – not only giving you more control over the substances in your life, but also strengthening the relationships with those around you. If you’re interested in finding out more, contact James Driver or Selina Clare about the next group start date. We will arrange an initial 30 minute interview with you. During this interview, we will discuss how the group operates and reach a decision together with you about whether group therapy is likely to be a good fit and meet your needs. If you decide that it’s not what you want right now, then there is no cost for this initial meeting. Otherwise, we will let you know when the group is starting and provide you with more information about what to expect and how to get the most out of the group. The total cost for the 8 groups and two individual sessions is $550. The group (consisting of 6-10 participants) will then meet weekly for 8 weeks, for 90 minute sessions on Wednesday evenings. At the end of these 8 weeks, Selina or James will make a time to meet with you for a 50 minute exit interview. During this time we will talk together about your experiences in the group and what, if anything, you might like to do next. It will also be an opportunity to give us feedback about your experiences, and to reflect on what you have learned and developed over the course of the group. I’m an experienced psychotherapist with a passion for group therapy. I’ve been in both individual and group therapy myself, and while individual therapy was very useful, I learned more, faster in the group than I ever did individually. More importantly, the group challenged me to change and really question my beliefs about myself, how others saw me, and the ways in which I related to others and I credit it with strengthening many of the most important relationships in my life. Since then I have facilitated therapy groups at two different drug and alcohol rehabilitation facilities and have seen others come away with the same benefits that I experienced first-hand. I believe groups can be challenging and at times confronting, but present an unparalleled opportunity for growth and understanding. I have facilitated groups across a wide variety of contexts, including working with eating disorders, addictions, and more general mindfulness or personal development groups. As well as facilitating groups for others, my experience as a participant in therapy groups has informed my practice and has helped me to see the immense value in offering people the opportunity to experience group psychotherapy. Personally I found group therapy a time of rich personal growth as I learnt about how I related with others, was perceived by them, and how I saw myself. Having seen my patterns of relating that weren’t fulfilling me, I had a safe and trusting space in the group to try new ways of relating to others and become more flexible in my relationship with myself and others. Ultimately this helped me to create more satisfying interpersonal experiences which increased my overall sense of wellbeing. I believe that this type of experience is simply harder to recreate in individually focused therapy sessions.